Right. I’ve always been fascinated with monkeys. When I was a kid you could buy a monkey in the comic book ads. 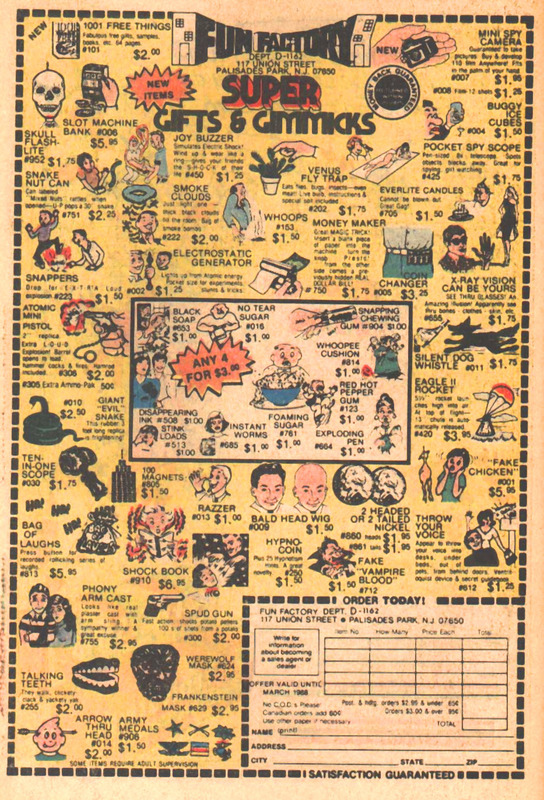 The same page where they sold you x-ray specks and whoopie cushions, and a submarine made out of cardboard big enough to hold you and one of your buddies. But best of all was a monkey so tiny it would fit in a coffee cup. And my old man was so cheap he wouldn’t buy me one. When I was a little kid in Pennsylvania, Janet Hennike (I put a picture of her sister, Ginger, in that video)… Janet was about five years older than I, and she won first prize at some sort of Sunday School contest. Top winner in the entire church. She had her choice of two prizes. One was a Bible, and the other prize was a monkey. She took the Bible. What a dope! Remember when Spencer had the pet monkey? It came from a test laboratory where they made it smoke cigarettes 24-7. Anybody remember that story? I think it’s in one of my collections. Spencer would buy stuff like this. Chewing gum that turns you teeth black, plastic vomit, and best of all, stink bombs! I remember Sid pimping out Spencer as the monkey with a hurdy-gurdy…one of my all-time faves. It would be so cool to get my hands on one of those cardboard subs, and also a lot of that other stuff! Kids today don’t understand how cool this stuff was. That story is in the collection that I’m putting together just now. It appeared in 1991. Cardboard? I thought that it was a real working sub for $6.98.